What about a trip to the lakes near to Milan? It is situated on the borders of Piedmont, Lombardy and Switzerland and very close to the Alps. 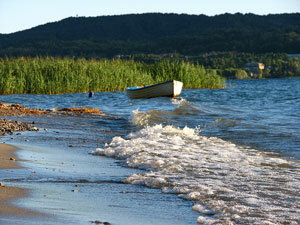 It is the second largest lake in Italy, after the Garda Lake. It is a relict of the wealthy patrimony which was lead by the Borromeo family. Stresa, a beautiful city along the lake and the mountains. It is a small and pictoresque town along the lake and offers a stunning atmosphere. It is a place with lots of green areas like gardens, palms and flowers. 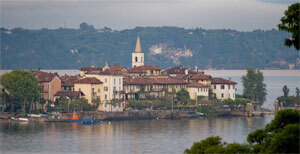 It provides a beautiful view over the lake and the Borromeo Islands (Isola Bella, Isola Madre, Isola dei Pescatori). Stresa gives an awesome panorama situated between mountains and the lake. It is a small city with warm atmosphere and elegant surrounding. On the right sight of the church Sant’Ambrogio, there is the Villa Ducale, built in 1770 in neoclassical style. Close to the villa it' spossible to find the modern Palazzo dei Congressi that usuall hosts international conventions. There is a cable railway up in the mountains used to bring tourists to the near ski area in winter, to give them the chance to see the town from above and get an even better and unforgettable impression. The Borromeo Islands are worth to see with their long and important history. The Lago Maggiore offers of a mild climate with a lush vegetation which make this area a favourite destination for tourists. Cities are connected trough ferries and motor boats lines so that visitors can have a great view on the lake. The Borromeo Islands took their name from the wealthy Borromeo family and are located in the Borromeo Gulf. 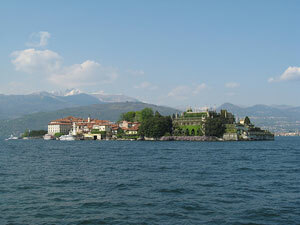 They are called: Isola Madre, Isola Bella and Isola dei Pescatori. With its botanical garden, it is the most green island among the three. You enter in a subtropical environment with rare plants and exotic flowers. You will find there an impressive building of the Borromeo family built in 1590. The isle - which is 320 meters long by 400 meters wide - is entirely occupied by the Palazzo Borromeo (Borromeo Palace) and its gardens: going there, you will have the sensation of living in a fairy tale. Carlo III Borromeo ordered to build the palace in honour of his wife Isabella D’Adda. The architectural style is Baroque and even the garden shows this epoch. In the park there are the truncated pyramid which contains statues, a fountain and several exotic plants. 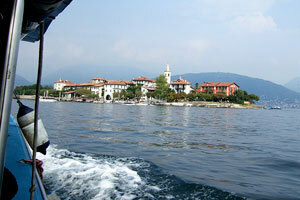 It is located on the north of Isola Bella and exactly in front of Stresa. It is an old fishermen’s island and more like an ancient, rustic, still untouched village. Yu will breath a quiet and natural atmosphere there and the centre of the village offers a wide variety of “Trattorie” (typical Italian eating house). The Lake of Como is another beautiful lake located very close to Milan. By the slowest train it just takes an hour to reach the lake from the city. It is also called “the star with the three points” because of its shape. There is the savage and pure Coloco’s branch, the natural jewel represented by the Lecco’s branch and the refined and elegant Como’s branch. The lake area offers a mild climate and you will have the chance to seat on a park bench and enjoy the quiet environment and the beautiful view. Since the Renaissance this area has been a famous holidays destination, especially for poets, writers and philosophers. Visit Como and take a boat trip along the lake, admiring its beautiful villas. Lake Como is the deepest lake in Italy and has a unique shape, with the southern end forked into two long "legs". With its beautiful villas like Villa d'Este at Cernobbio, and the famous silk factories, it is a favorite tourist destination in Northern Italy. 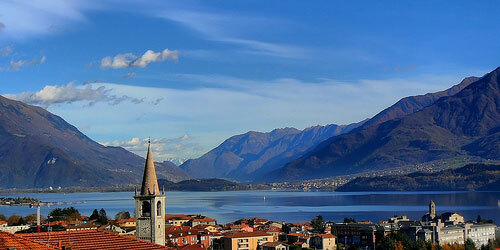 There is a city situated in the south of the lake and owning the same name – Como. Como is a quiet and peaceful town hosting many villas. 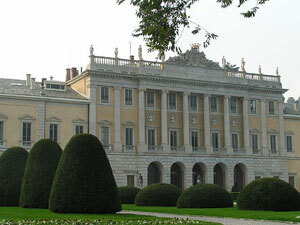 One of the most interesting is Villa Olmo. You can walk along the lake and pass various villas to get to this special and romantic place where weddings, conferences or exhibitions take place. It has an enormous park with a fountain in front of the building and statues everywhere on the courtyard. It was built in the 18th century by Simone Cantoni for Count Innocenzo Odescalchi and today it is owned by the Town Council. The villa contains richly decorated rooms where famous people as Napoleon or Garibaldi stayed. There is also a family chapel and a splendid ballroom. 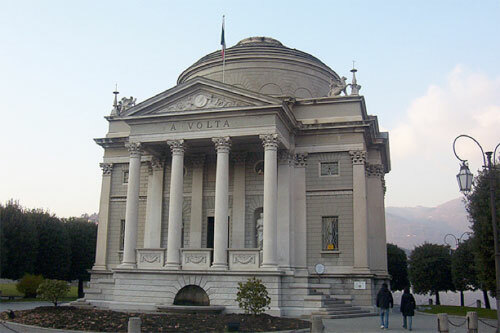 The Tempio Voltiano (Volta Temple) - dedicated to Alessandro Volta, who was citizen of Como and who changed the world with his studies on electricity - represents another attractive itinerary. The villa is open November - March from 10.00 to 12.00 a.m. and from 2.00 to 6.00 p.m., April - October from 10.00 to 12.00 a.m. and from 3.00 to 6.00 p.m., and closed on Mondays. The temple is a neoclassical building erected in 1927 for the centenary of Volta's death. Now it is a museum showing instruments built by the great scientist and used to carry out the experiments with gas and electricity that led to his invention of the battery in 1799. The true heart of the city is the piazza across the church S. Fedele. From there you can go to Via Natta with its 16th century building owning the same name of the street and then to Via Adamo del Pero until Via Vittani, which is also a very old street where you will find many buildings and interesting frescos belonging to different ages. Another must is “il Broletto”, situated just next to the Duomo. 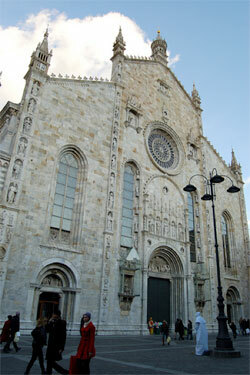 The Duomo was built in 1397 and was originally just an enlargement of the church S. Maria Maggiore. The Broletto, the ancient Palace of Reason from 1215, was used as a theatre in the past and today as a location for different exhibitions. 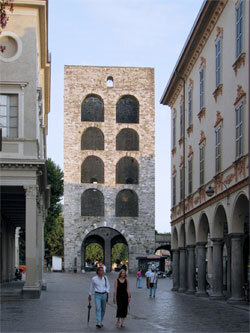 Porta Torre, which is an ancient gate, is situated in the southern part of the city centre walls. This tower is the only still standing gate of the city wall, which was rebuilt by Barbarossa after its destruction operated by Milan power during the war. Along the street outside the walls you will find markets three times a week. The most Mediterranean of the Alpine Italian lakes, it offers nature and colours in a beautiful landscape. It is surrounded by small towns and little villages and offers all kinds of sports. This is the reason why it is a favourite tourist location in all seasons. You will find relicts of Roman settlements, medieval castles and noble villas, as well as churches in Baroque style. 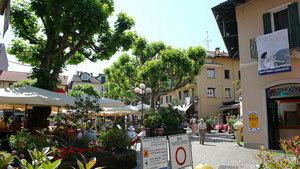 Desenzano, situated in the South-West of the lake, is a lively town with lots of culture, history and folklore. Due to its central position - it is really easy to reach from other cities and it is located between the airports of Montichiari and Verona - Desenzano is considered to be the “capital town” of the lake. A trip to Desenzano offers a variety of opportunities for sports (especially water sports), excursions (e.g. by ferry) and events through the whole year. 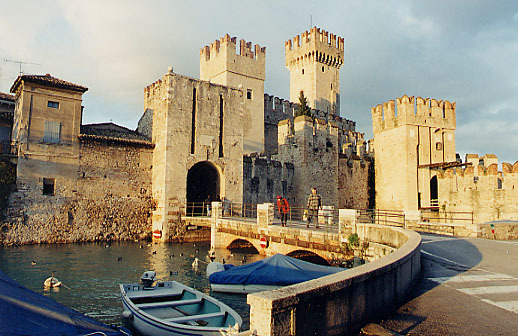 You can combine your trip with a visit to Sirmione which is a peninsula in the East zone. It is a historic town surrounded by water where you will breathe a nice atmosphere. 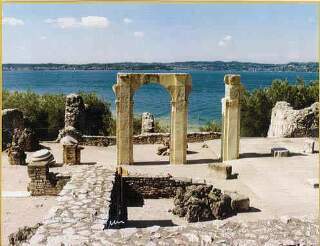 At the end of the peninsula it is possible to find ruins of an old Roman villa, the Grotte di Catullo, shrouded in mistery of several legends. To get there, you will pass the Castle Scaligero that offers a perfect view over the lake. Visit the beautiful and romantic city of of Verona, home of Romeo and Juliet. The Roman Arena is the city's grandest sight, but the so-called "Juliet's balcony" is also a well known attraction on the Shakespearian tourist trail. 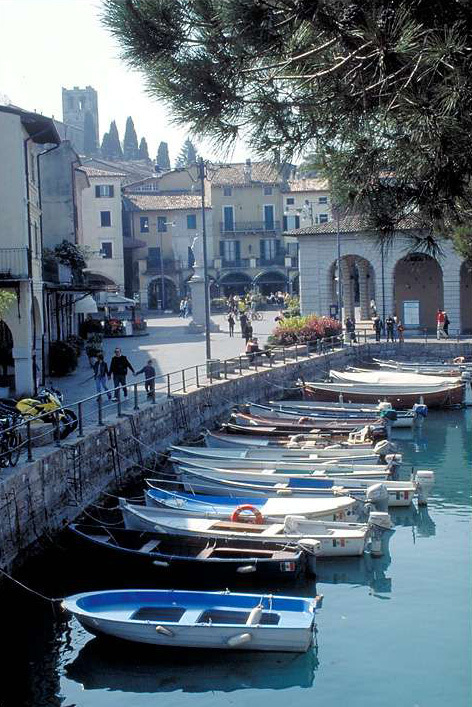 Also visit the beautiful lakeside towns around Lake Garda which have charmed visitors for centuries.